Zion Market Research has published a new report titled “Parenteral Nutrition Market by Nutrient Type (Carbohydrates, Parenteral Lipid Emulsion, Single Dose Amino Acid Solution, Trace Elements, and Vitamins and Minerals) and by End-users (Hospitals, Clinics, and Others): Global Industry Perspective, Comprehensive Analysis and Forecast, 2018 - 2024”. According to the report, global parenteral nutrition market was valued at approximately USD 1.62 billion in 2017 and is expected to reach around USD 4.39 billion by 2024, growing at a CAGR of 15.8% between 2018 and 2024. Parenteral nutrition has been used in clinical practice for over a quarter of a century. It provides better nutritional requirements for optimal growth and maturation of the person. It has revolutionized the management of chronic medical conditions such as short bowel syndrome, gastrointestinal disorders, and malnutrition in infants as well as adults. Advancement in techniques has led to the development of highly sophisticated delivery systems and catheters for parenteral nutrition. The global parenteral nutrition market is growing rapidly, with increasing incidence of malnutrition. According to WHO, globally around 45% of deaths among children of age 5 are linked to malnutrition. The other factors such as increased prevalence of chronic medical conditions, increased awareness regarding the benefits of parenteral nutrition in disease management, rising geriatric population are driving the growth of global parenteral nutrition market. Moreover, augmented focus on parenteral nutrition for cancer treatment and escalating demand for high-quality medical services are expected to augment the growth of global parenteral nutrition market. The relative rate at which population is aging is much faster than it was in the past. Factors such as the increasing life expectancy due to advanced healthcare facilities coupled with innovation in the treatment of diseases it is mainly older people who are seeking for parenteral nutrition. Lot of time the patients are also accompanied with significant muscle mass loss medically known as sarcopenia due to under-nutrition. According to the World Health Organization by the year 2020, the total number of people aged 60 years and older will outnumber population younger than 5 years. 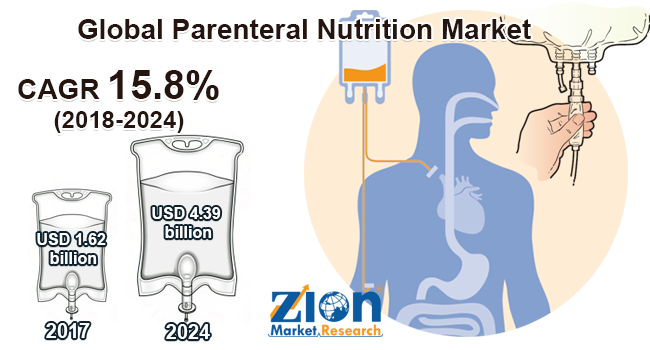 By nutrient type, the global parenteral nutrition market is divided into carbohydrates, single dose amino acid solution, parenteral lipid emulsion, vitamins and minerals, and trace elements. The carbohydrate segment dominated the global parenteral nutrition market accounting major global revenue share. Single-dose amino acid solutions are also largely being employed in numerous parenteral therapies. Single- dose amino acid solutions and lipid emulsion were the fastest growing segments in the market and are expected to generate significant revenue in the forecast period. North America accounted for major revenue share and is expected to remain dominant region over the forecast period. Europe was the second largest market followed by the Asia Pacific. Asia Pacific market is projected to grow at the highest rate during the forecast period. The Middle East and Africa and Latin America are also expected to experience moderate growth in the parenteral nutrition market in the years to come.